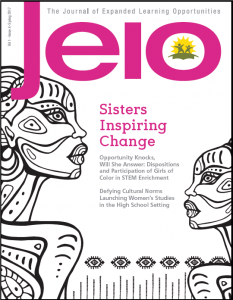 In a previous post, we invited Julia Rugg, WINGS For Kids’ Chief Strategy Officer, to serve as a guest blogger. We featured WINGS because of their afterschool focus on SEL skills and their recent expansion to Pomona Unified School District. 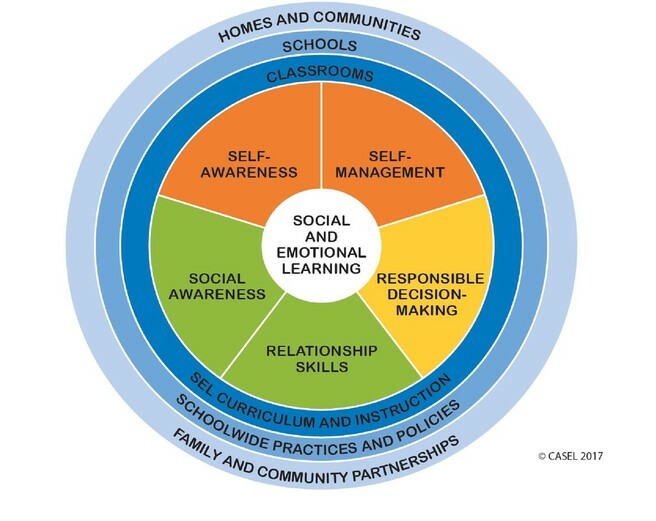 Below, we offer part two of her two-part post, which focuses on the program strategies they employ to promote SEL. Kids attend WINGS for three hours a day, five days a week during the school year to maximize our model’s positive impact. Each week, kids focus on one of ten sequenced social and emotional learning objectives. Our staff first explicitly teach, then model and reinforce, social-emotional skills. Kids learn, then practice and discuss, the new skills through program activities. Let’s use one of our objectives in the self-management competency—helping kids focus their attention inward in order to limit outward distraction—as an example. The WINGS day begins with Community Unity, the coming together of all staff and kids in grades K-5, for announcements, a nutritious snack, recital of the WINGS Creed, and a social-emotional skill-building lesson. This part of the day offers an opportunity to talk in a focused and active way about the week’s objective and engage in a brief, fun activity that relates to it. This week, WINGS Leaders lead an exercise on active breathing, and the program director starts a focused large-group discussion and asks staff and kids to share examples of when they have gotten distracted. Next is Choice Time, an enrichment activity that students select each semester and where social-emotional lessons are woven in. Our flexible afterschool schedule provides ample time for both structured academic support and kid-driven enrichment and activity time. During a kickball game, for example, a WINGS Leader might talk about how to concentrate on breathing while kicking the ball and ignore the shouts from the sidelines to better focus on the game. This also gives kids the chance to continue practicing other skills they’ve previously learned, such as sharing supportive comments after a bad kick and keeping a positive attitude even if their team is losing. In this way, Choice Time encourages kids to engage in active and explicit learning to applying both new and recently developed skills to settings other than the classroom. Choice Time is followed by Academic Center, where students work on homework with help from program staff. In addition to providing assistance and encouragement in a positive atmosphere, WINGS Leaders capitalize on teachable moments to keep bringing kids back to the week’s learning objective. In this case, they might work with students to practice positioning their bodies in their desks so they are less likely to be distracted, explicitly defining the skills being learned. 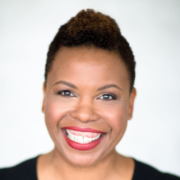 Julia Rugg is the Chief Strategy Officer at WINGS for Kids. Since July 2011 she has launched WINGS’ expansion efforts across the southeast with the CEO, and worked alongside the senior team to ensure the WINGS model has been replicated with fidelity and quality. 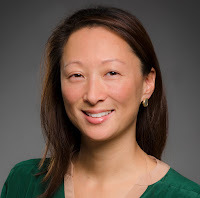 She evaluates current and future growth opportunities for WINGS, develops partner relationships, and builds the necessary internal infrastructure and resources necessary to support growth. Labels: afterschool, Julia Rugg, SEL, WINGS for Kids! ​Pomona Unified School District (PUSD) announced that they are expanding their partnership with WINGS for Kids in order to promote SEL related skills among their youth. 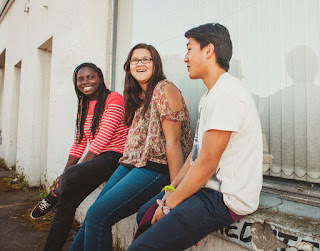 In addition to its partnership with PUSD, WINGS serves more than 1,100 students from vulnerable communities in Georgia, North Carolina, and South Carolina through a direct-service afterschool program model of their research-based curriculum led by college students, known as WINGS Leaders. To learn more about the WINGS approach, we invited Julia Rugg, WINGS’ Chief Strategy Officer, to serve as a guest blogger. Below, we offer part one of her two-part post. Report after report tells us that too many kids in low-resource neighborhoods fare worse in overall education and life outcomes than their peers in higher-resourced areas. And while we know that social-emotional skills help narrow this tragic gap, we also know that classroom teachers often do not have the time, resources, or training to focus directly on helping students develop social-emotional skills during the regular school day. 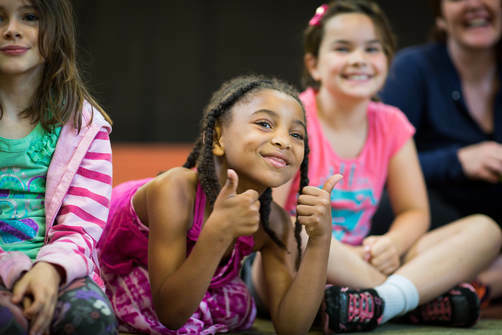 WINGS for Kids believes that afterschool programs are well-positioned to address this educational gap by directly teaching social-emotional skills like self-awareness and responsible decision-making. We see both value and opportunity in using the hours after school to help teach these critical skills to our most vulnerable kids—the students who need them most. The forthcoming results of our own randomized control trial, or RCT—the first such in-depth study on SEL in the afterschool space—corroborate what other research has shown: quality afterschool programs that focus on social and emotional learning have a significant positive impact on students in and out of the classroom. This is especially true for children living in low-resource neighborhoods, who typically are academically behind their peers, and for whom the bulk of the school day is spent working hard to close that achievement gap, with little time in the day to teach and practice skills beyond math, reading, and writing. In WINGS schools, we take advantage of the flexibility that afterschool offers to not only teach social-emotional skills, but use the additional time it affords for kids to practice them and apply them in social and academic settings. Our program model is influenced by research from Joseph A. Durlak and Roger P. Weissberg that tells us afterschool programs aligned with four evidence-based best practices—sequenced, active, focused, and explicit, or SAFE—have greater effects on student outcomes. To that end, we’ve aligned WINGS to the SAFE framework to ensure we are infusing intentionality throughout our activities and our curriculum. We leverage the power of relationships in the afterschool space to help kids learn, practice, and internalize social-emotional skills. WINGS Leaders—college-aged mentors—work with small groups, called nests, of 10-12 kids. This personalized instruction, led by young people with backgrounds similar to those of our kids, have a relevance and impact that teacher-led activities sometimes don’t. Our data supports what we see each day: what kids learn in the hours after school influences their actions and behavior inside the classroom. Our aforementioned RCT study shows that WINGS reduces kids’ negative classroom behaviors and increases their positive classroom behaviors. Our programming also helps kids name positive behaviors, develop the vocabulary to talk about their emotions, and better regulate their behavior, both inside and outside the classroom. Photo Credit: WINGS for Kids! ​Internal data from our programs in Charleston, S.C., also shows that WINGS kids are less likely to be chronically absent from school and less likely to receive a disciplinary referral compared to their peers—key predictors of academic success and graduating from high school. 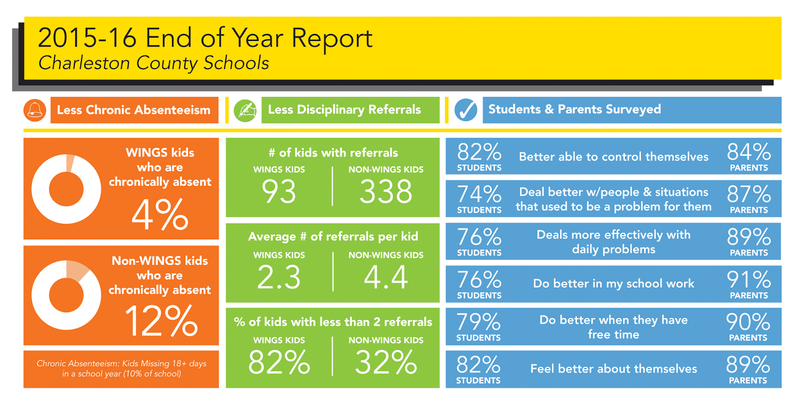 With this research in hand, we know that WINGS works—and we want to bring SEL to more of the kids who need it most. Through our direct-service programs in Charleston, S.C., Charlotte, N.C., and Atlanta, Ga., WINGS gives more than 1,000 students in grades K-5 the life lessons they need to succeed and be happy, and help them thrive despite the challenges they face every day. This year, we’re also expanding our partnership model to all schools in Pomona (Calif.) Unified School District by training and coaching providers and staff to integrate SEL into the district’s long-standing and award-winning afterschool program, The Learning Connection. As a result, more than 1,700 kids in Pomona will be able to develop social-emotional skills to prepare them for success in school and in life. At WINGS, we envision a world where there is equity in academics, opportunity, and emotional well-being for all children regardless of socioeconomic status. That’s why we work to ensure that every child has the opportunity to access high-quality afterschool programming, caring adults and mentors, and social and emotional learning. By bringing these pieces together, along with research and through an evidence-based model, a program like WINGS has the power and potential to close the gaps that can prevent America’s most vulnerable kids from soaring to success. Education Trust-West, an advocacy organization in Oakland, estimates that 750,000 students in California’s preK-12 schools have an undocumented parent, out of a total enrollment of 6.2 million - that equals 1 in 8. Some of these students may be undocumented themselves. Because many of our afterschool programs are part of the school community, we thought this would be relevant. Read their new brief. School officials state anxieties have reached new heights since Donald Trump’s inauguration, with possible consequences on young people’s ability to focus on school work, the willingness of parents to attend school events, or even to bring their children to school. 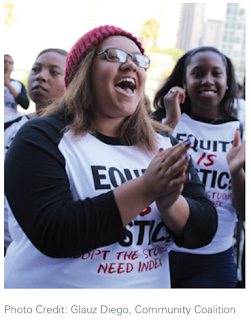 The California Equity Leadership Alliance (CELA) recently released a toolkit to support undocumented students and families. There are three toolkits for students and families, educators and administrators, and school board members and policymakers. To review these, click here. CELA issued a statement on California’s undocumented students and their families. We found it very compelling and offer an excerpt below. California is a state sustained and enriched by immigrants in a nation founded by immigrants. As such, CELA wholeheartedly supports the fundamental right for all children – regardless of their immigration status or the status of their family members – to receive a strong, equitable education. This commitment not only reinforces the legal right to education, it is in the best interest of California and our continued leadership as a state at the forefront of innovation, industry, and progress. Our roles as leaders in education – from administrators and educators to parents and policy advocates – compel us to reaffirm our dedication to these students and offer guidance for a more equitable California. We believe this means not only supporting efforts to keep our students safe, but also ensuring we do all we can to offer them the best chance to graduate prepared for college, a career, leadership, and life. For too long, the arena of education advocacy has been siloed from the arena of immigrant rights advocacy. It is imperative that education organizations such as ours bridge this divide and do all we can to support the educators, administrators, and advocates who work with these students and their families every day. As such, we have launched a new initiative to provide resources, support, and stewardship for educators in order to understand our undocumented student community. Living our values as Californians means standing up – and standing with – the hundreds of thousands of undocumented students in our schools and the 1 in 8 California P-12 students who have an undocumented parent. Our students deserve nothing less than our steadfast support. What is your school and afterschool program doing to support young people who are undocumented or have undocumented family members? We will provide more discussion and resources in upcoming posts.